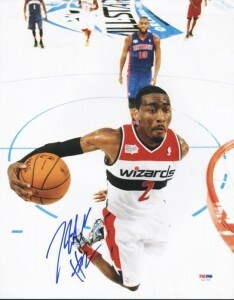 Picked out of the University of Kentucky, John Wall was the first overall pick by the Washington Wizards in the 2010 NBA Draft. An immediate contributor to a team undergoing a rebuilding process, Wall's relentless work ethic, charismatic personality and media savvy made him the instant face for the franchise. He is also a cornerstone for the franchise to build around. Coming out of a Kentucky, a school known for producing top talent, made the transition to the NBA relatively easy for this mild-mannered player. 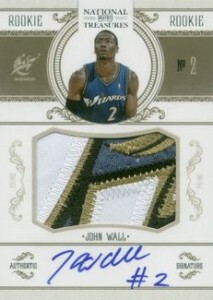 It has also helped John Wall cards and memorabilia gain notoriety in the hobby. A gifted two-way athlete, Wall is comfortable on either end of the floor. Defensively, he has a prowess for chasing down perimeter rebounds and stealing entry passes. On the offensive end of the court, his points per game average and assists per game both exceed the league average. In his first full season at the NBA level, he averaged just over 37 minutes per game, a testament to the commitment and faith the Wizards have in the young guard. Wall earned NBA All-Rookie First Team honors and was awarded the NBA Rookie Challenge MVP. Interesting to note, on November 10th of 2010, Wall recorded a triple-double, his career first, and became the third youngest player to accomplish the feat and only the second rookie. The other rookie: Magic Johnson. Lofty company, indeed. 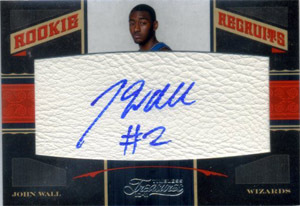 As a result of his early success, Wall's top rookie cards and autographed items are quite popular with basketball card and memorabilia collectors. While it may take a while for his collectible values to attain the level of top-tier players, the investment potential of his collectibles is fairly high. Winning breeds collectibles success more than individual accolades, so it will be important for the Wizards to develop additional talent for Wall to reach the next level. 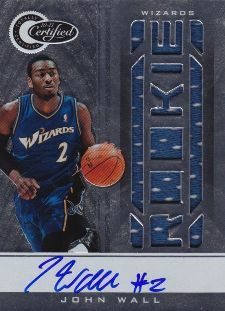 The most valuable John Wall rookie card, it's highlighted by great patches, an on-card signature and a low print run of 99. Limited is a hit-or-miss product, with 2010-11 being an on year. 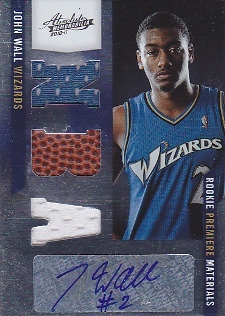 The high-flying image and print run of 249 make the Limited Phenoms one of the kings of John Wall rookie cards. Timeless Treasures is a brand that focuses heavily on the laundry tag and logoman relics. 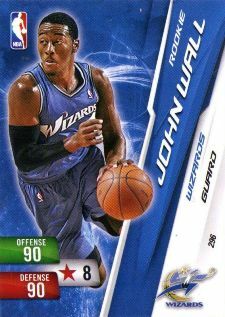 It's fair to say this isn't the greatest John Wall rookie card as the card design isn't very appealing. The card does carry a print run of 299, which makes it fairly tough to find. 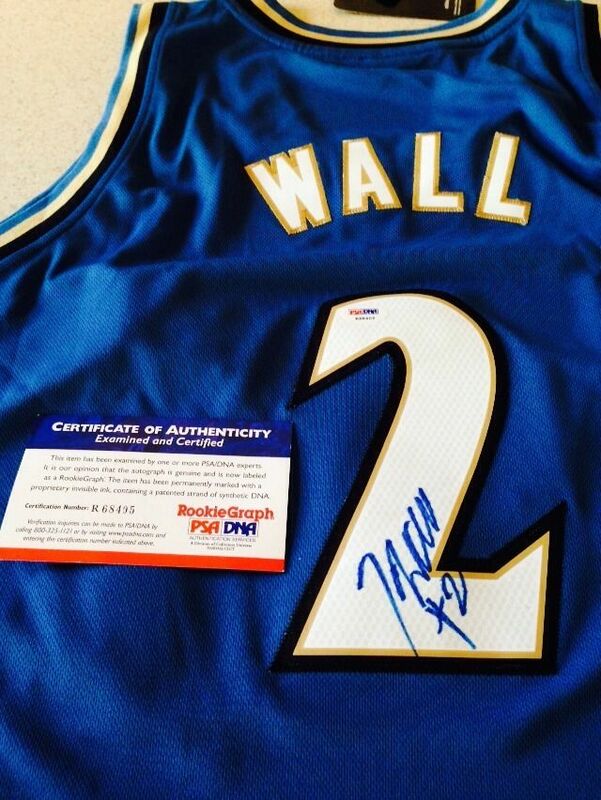 Below you will find an example of what John Wall's authentic signature looks like. This can be used as a first point of reference for determining the legitimacy of autograph memorabilia, but is not a substitute for having your items authenticated by a well respected professional autograph authentication company. Reputable authentication companies include JSA, PSA, Panini Authentic, Upper Deck Authentic, Tristar, Steiner and Mounted Memories to name a few. Click on any of the images below to view full size photos. The letter "J" is over-sized and upside down. A short squiggle line on a 45 degree angle implies the letters "o-h-n."
The capital "W" has a slight curl on the left starting the letter, the pen stroke fades as it comes off the surface on the final upstroke. The letter "a" is easily legible. The letters "l-l", are actually numeral "1"'s, making the number "11" which is Wall's jersey number. SIGNED PSA DNA JOHN WALL SWINGMAN REVOLUTION JERSEY! 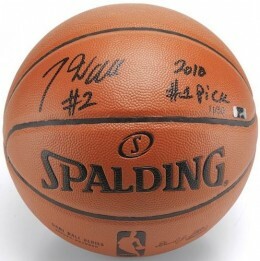 WIZARDS NBA AUTO COA! What about his “Next Day Rookie Auto” from 10’11 Panini Limited #/99? It has an on-card autograph and is a rare card. Why no mention? 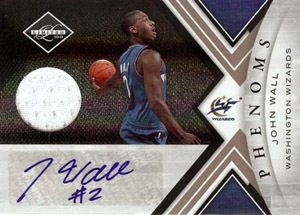 This card was Panini’s attempt at remaking Topps Rookie Photoshoot autographs, which were case hits from the first basketball product of the season – Topps. Back in the good ol’ days. Chris Gonsalves � It is a cool card. It’s not included as it’s an insert and not his rookie from Limited.